In October we go to Africa, for our exhibition called Savanna. Ron Reeder and his very talented wife Judy Roan have collaborated to produce beautiful, romantic portraits of some of natures most powerful and amazing mammals. Joining Ron & Judy will be Santa Barbara photographer Shaun Walton. 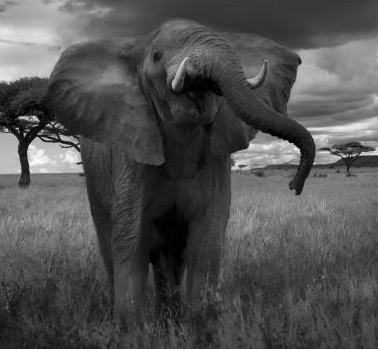 Shaun’s images are graphic high contrast intense black and white images of the roamers of the African Plains. His focus is their movement at night. His ability to capture wildlife in a way we have never seen before makes these images unforgettable. Ron Reeder and Judith Roan, partners in life and art. Ron and Judy have collaborated since they first met in 1978. For 24 years they ran a research lab together at the Hutchinson Cancer Center in Seattle. Upon retirement in 2002 the collaboration continued as they expanded their hobby interest in photography into a more serious effort. They have taken photo workshops together, hired models and experimented with studio figure photography, and have gone on numerous joint photo expeditions. They routinely critique each other’s work. Each partner has developed a distinct vision and approach to photography. Judy has become a wildlife photographer with an emphasis on birdlife. Ron started with landscapes but has since tried many different directions, including nudes, still life, portraits, and photo composites. For the images in this show, Judy was the adventurous one who joined a group traveling to Tanzania to photograph African wildlife. Ron grumped about hating airlines and stayed home. But when Judy returned they worked together in editing the 2000 or so images she captured. Then Ron made all the prints in hand-coated platinum/palladium. Technical information. All the images were captured with a Nikon D300 digital camera using a 80-400mm telephoto lens. Images were edited and turned into black and white, then contact printed on Arches Platine paper hand-coated with sensitized platinum/palladium. Shaun Walton is a photographer who has successfully combined his background as a trained biologist and professional wildlife guide with his love for photography. He is best known for his striking black and white images of leopard and lion taken in the wild at night in South Africa. In a fluid mixture of documentary and fine art photography, Walton successfully captures the essence of these animals’ mysterious and tumultuous nocturnal lives. Walton’s work has been exhibited several times in both solo and collective exhibitions and he is the recipient of several awards including first prize in the 2012 PDN Photo Faces competition. A recent high point in his career was the purchase of one his pieces by the Santa Barbara Museum of Art for their permanent collection and the exhibition Portrayal/Betrayal. He is currently working on his first book with Nazraeli Press.